An exciting new position is available with a newly-formed team within the Corporate Affairs Department of Fiji Airways. 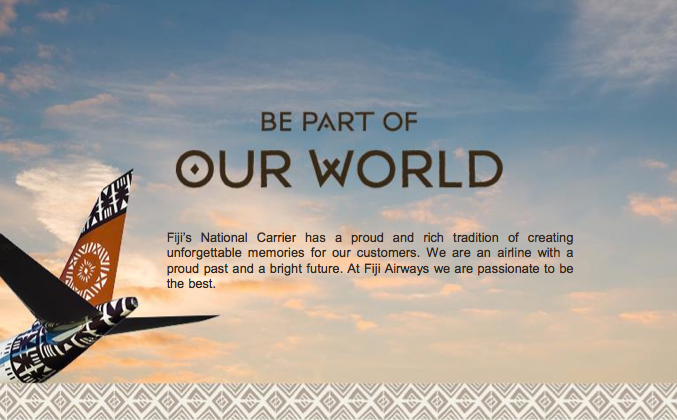 The Creative Designer is responsible for the layout of Fiji Airways inflight magazine. You will design the look and feel of the magazine and collaborate with key stakeholders to innovate and create experiences that engage audienes, while achieving Fiji Airways goals. The Creative Designer will also assist to fulfill creative requirements of the wider Corporate Affairs Department. This position will be based in Nadi & will report to Manager Public Relations. Provides design assistance for any other duties as assigned by Manager Public Relations or EGM. Positive attitude and excellent organisational skills. We require applicants to have the right to work in Fiji.